A happy day for Doris and her friends!!! It was a day of celebration at Our Lady of Lourdes in Huddersfield. Had Christmas come early?? No, not Christmas, but an application for funding from Kirklees Council for a brand new freezer has been granted! For the first time in months we can have ice cream!! This may seem like a small item to many but actually it makes a huge difference to our groups in Huddersfield. Our attendees now have more choices and we waste less food as we can freeze leftover items. 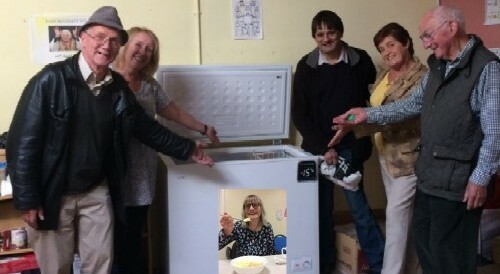 As you can see from the photo our team of volunteers are more than excited about the new freezer!!! And as for Doris enjoying her ice cream what more can I say! A huge thank you to Kirklees Council for all their help and a special thank you to Beverley Cauldwell, who supported our application.